Dr France Gerard (CEH) reports on her recent visit to Boyaca, Colombia with her colleague Dr Maria Paula Escobar-Tello (Bristol University). They were meeting Colombian collaborators and local communities in preparation for the upcoming field campaigns in the páramos of Boyacá, Colombia, a key element of the UK-Colombia funded PARAGUAS project. Maria Paula and I have just had an amazing 10 days in Boyacá (14–24 January) as our work on the PARAGUAS project enters an important phase. This trip was in preparation for our actual field campaigns which are planned to start in February 2019 and will continue until shortly before the end of our project (July 2021). We came to Boyaca to meet local government officials and communities to explain our plans and ask for their support and participation. Our collaborators from UPTC, Adriana Espinosa, Jeffrey Prieto, Manuel Galvis Rueda and Liliana Rosero, who organised our itinerary and facilitated our meetings, were central to the success of this trip. The journey started in Tunja with a joint presentation at the UPTC where we introduced the PARAGUAS project to UPTC scientists, students and government officials, followed by a question and answer session. Our collaborator Prof Conrado Tobon – from the National University of Colombia and expert in hydrology - joined us through SKYPE to help answer questions related to the planned hydrological monitoring. Our ambition to integrate knowledge about the páramo from local people, living near and interacting with the páramo, with detailed field observations on plants, soil and hydrology into a combined biogeochemical and hydrology model of micro-catchments, was very well received. This very first event also helped us link up with teams and individuals with extensive research expertise in many aspects of the páramo. Above: At UPTC (Tunja), Maria Paula and I are introducing the PARAGUAS project to the scientific community of Boyacá (Colombia) with expertise in many aspects of the páramo. We also met up with key individuals in the Boyacá government — Giovany Viasus (Director de Medio Ambiente) and team — and in CorpoBoyaca — Hugo Armando Diaz (Director planeación) and team — who received us with great enthusiasm, and offered us support and valuable advice. We reviewed the selected field sites and agreed collaboration to ensure that the hydrological monitoring in the 12 micro-catchments, initiated by PARAGUAS, would continue beyond the lifetime of the project. 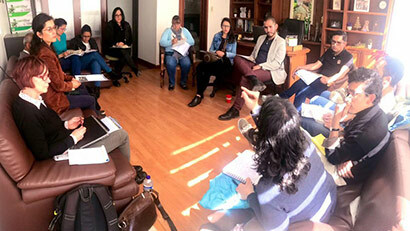 Above left: Discussing PARAGUAS with government officials of Boyacá: Giovany Viasus, Director de Medio Ambiente, and team. 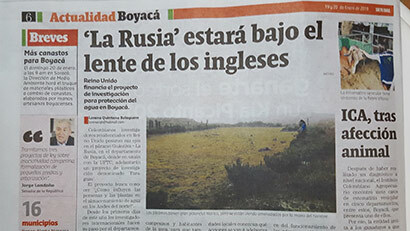 Right: PARAGUAS in the local Boyacá newspaper. In the next stage of our itinerary we travelled along the páramo Guantiva-LaRusia to meet with the people interacting with the páramo: land owners, community leaders, farmers and conservationists. We travelled to the páramo regions of Paipa, Duitama, Belen, Tutazá, Santa Rosa di Viterbo and Susacón. Maria and I were positively surprised and moved by the people we met. We were shown a genuine interest and a willingness to participate in our project, which we did not expect. Common messages, regardless of people’s backgrounds, were worries about preserving the water supply, worries about maintaining or improving livelihoods, a lack of dialogue between authorities and local communities and a need for fair solutions. The trip took us into the páramo, villages, houses, fields and meeting places. "We were shown a genuine interest and a willingness to participate in our project..."
My 'take home' message from these encounters is that feedback is crucial. We must ensure the communities of Boyaca have access to the knowledge we will gain through our observations and modelling about how the páramo functions. Photos: The team travelling in Boyacá to meet land owners, community leaders, farmers and conservationists. From left to right: Adriana Espinosa (UPTC), France Gerard (CEH), Maria Paula Escobar-Tello (Bristol University), Jeffrey Prieto (UPTC); Manuel Galvis Rueda (UPTC), Jeffrey again, one of our local guides; and our committed driver, who is taking a well-deserved nap. Photos: Some of the local people we met during our trip in Boyacá (Colombia). The PARAGUAS project is supported by the NewtonCaldas Fund and funded by the NERC and AHRC [grant number NE/R017654/1]. PARAGUAS is jointly led by Principal Investigator Dr France Gerard (Centre for Ecology & Hydrology) and Co-Investigators Dr Ed Rowe (Centre for Ecology & Hydrology), Mauricio Diazgranados (Royal Botanical Gardens, Kew), David Large (Nottingham University), Wouter Buytaert (Imperial College London), Maria Paula Escobar-Tello (Bristol University), Dominic Moran (University of Edinburgh), Michael Wilson (Loughborough University) and supported by the research group ‘Biología para la conservación’ of the Universidad Pedagógica Tecnológica de Colombia (UPTC) – Dr Adriana Janneth Espinosa Ramirez, the Instituto de Investigation de Recursos Biologicos – Alexander von Humboldt (IAvH) - Dr Susana Rodriguez-Buritica, The Universidad Nacional de Colombia (UN) - Prof Conrado de Jesus Tobon Marin and the Institute of Hydrology, Meteorology and Environmental Studies (IDEAM) - Dr Liz Johanna Diaz.